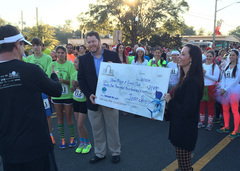 The Ocala Reindeer Run raised more than $21,000 for the Boys & Girls Clubs of Marion County. (PRLEAP.COM) December 16, 2014 - OCALA, FL — Gateway Bank of Central Florida, along with more than 300 runners and community sponsors, raised $21,490 in support of the Boys & Girls Clubs of Marion County at the annual Reindeer Run on December 13th. 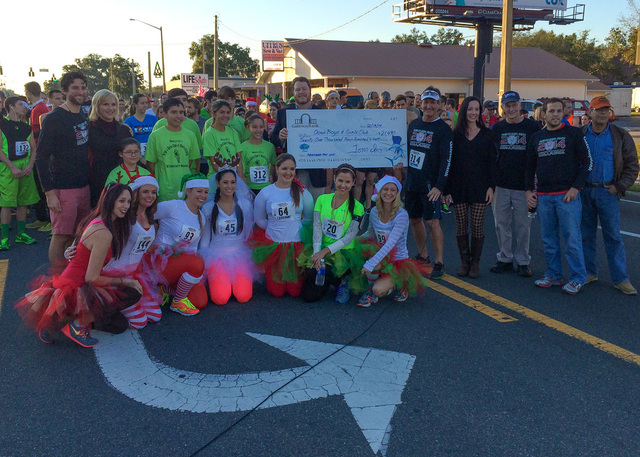 The race, which started and finished at Gateway Bank on Silver Springs Boulevard, kicked off the 59th annual Ocala Christmas Parade. 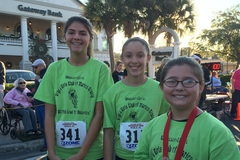 The 5K event included several runners from the Dunnellon Unit of the Boys & Girls Club. Club member Victoria Ricketts placed third in the Rudolph Dash. Other club runners included Seigo Aponte, Tanner Bergeron, Brandon King, Janyris Torres and Rosie Bailey. "The heart and soul of Gateway Bank is built around the community. Supporting the Boys and Girls Club thru the Reindeer Run was a great way to show our support for young people, especially those in the most need," said Tom Ingram, CEO of Gateway Bank of Central Florida. "We embrace the mission of the Boys & Girls Club to help our youth reach their full potential as productive, caring, responsible citizens." Past board chairman Michael Warren received the check for the clubs. "The Boys & Girls Clubs are in the business of building great futures for more than a thousand kids in Marion County. We are tremendously grateful for the support of Gateway as well as all the sponsors and runners whose support will make a difference in the lives of our kids." 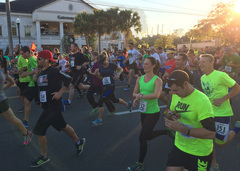 In addition to Gateway Bank, the event was sponsored by FBC Mortgage, Palm Chevrolet & Kia, Zone Health & Fitness, Ford Lincoln of Ocala, Agricon, Infinite Ale Words, Ocala4sale, Florida Express Environmental, The Runner's Pace, Signature Brands, ClosetMaid and George Mangan Insurance. For a complete list of results and sponsors, please visit http://ocalareindeerrun.com/.